Click here for the 2013 program. The Rail Summit’s Diolkos Award recognizes an individual whose outstanding leadership and vision have highlighted the importance of rail’s impact on our economy. The award is named Diolkos because of the Diolkos wagonway that dates back to 600 B.C. and is considered to be the ancestor of the railway. While some dispute aspects of this archaeological discovery, there is agreement that it was used to transport boats over the Isthmus of Corinth. Men and animals pulled wheeled vehicles along limestone grooves, referred to as the original tracks. These grooves kept the heavily loaded wagons on the route. Evidence substantiates the fact that this 6 km to 8.5 km wagonway, the original Short Line, was used for more than 600 years, until 100 A.D. Although it took mankind nearly two millennia for the transcontinental railroad to be developed and jumpstart our national economy, the impact, efficiency, and profitability of Short Line Railroads on our economy continues to increase significantly year after year. 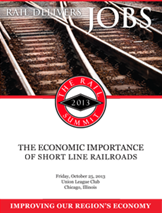 THANK YOU SPONSORS FOR YOUR VALUED SUPPORT OF THE RAIL SUMMIT 2013! 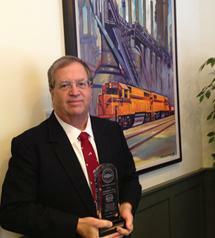 We sincerely appreciate our sponsors who made it possible to deliver a dynamic and informative 2013 Rail Summit. We extend a warm thank you to them. As business leaders, our sponsors are committed to furthering collaborative cooperation within our region to ensure its economic vitality. It was a privilege to partner with them.